If you’re an Amazon seller living in the US, then you’re probably aware that tax time is right around the corner. In fact, Amazon just released the 1099-K forms just a few days ago. Businesses are required to file taxes by March 16, 2019. And personal taxes are due by April 15, 2019. For a lot of folks (myself included), taxes can be a bit of mystery. So, I’ve compiled some information to help you navigate the tax waters, so to speak. I’m not even going to beat around the bush with this one: yes. A resounding YES! Unless you’re a tax expert (ie. you’re already a certified public accountant), getting a professional accountant to handle your taxes is one of the best things you can do for your business. Since taking on a business partner back in 2016, for my own Amazon FBA business, a professional accountant has handled all of my taxes. And while there is a cost associated with having an accountant, in my experience a good accountant not only saves you that much in taxes (and then some), but could possibly even turn owing taxes into getting a refund back. If you’re not sure where to find an accountant, e have a few third-party accountants hand-selected by Jungle Scout that we suggest in our marketplace. Check them out: Jungle Scout Market Accountants. A 1099-K form is a sales reporting form issued by Amazon, and similar businesses. It provides the IRS with annual and monthly gross sales information, and includes sales tax and shipping fees. If you’re an individual online seller, don’t worry. You don’t have to fill out this document; Amazon does it for you. They even send it to both you and the IRS, as long you meet the requirements. Who gets a 1099-K form on Amazon? Not every Amazon seller gets a 1099-K form from Amazon. To meet the requirements for a 1099-K, you must have both $20,000 in total sales, and 200 individual transactions. However, if you have at least 50 transactions, you still need to provide your tax status to Amazon. If you don’t, you risk losing your ability to sell on the platform. Plus, it’s easy. You can provide Amazon with your tax information via your Seller Central account, under ‘tax information’. Where can I find my 1099-K form? First, login to your Amazon Seller account. Next, click on the Reports menu. From there, select Tax Document library. And finally, download/print your 1099-K for the year. What if my 1099-K form is inaccurate or I didn’t receive one? Amazon is a multibillion-dollar Goliath, but even they make occasional mistakes. If Amazon didn’t issue you a 1099-K form, contact Seller support. First, make sure you’re reporting the unadjusted total gross sales for the entire year. These are based on a product’s shipping date though, rather than the sale date. Therefore, if you made a sale on December 31st, 2018, but it didn’t ship until January, it won’t be on the report. Go to Seller Central and select the Reports tab. Next, select Date Range Reports. Select reporting range: Monthly or Custom, and the specified date information. Once the report is generated (it can take up to an hour), review the report in the list on the Date Range Report. Calculate your unadjusted gross sales by adding the amounts in the report columns together; they’re listed in the two charts. Do I need a business license to be an Amazon FBA seller? Nope! Unless your state requires you to have one, you don’t have to have a business license to sell on Amazon. Of course, if you have a larger Amazon business, with employees, offices, and other big-time expenses, it’s probably a good idea to get one. Based on my four years selling on Amazon, I recommend that sellers get a business license. Not only will a Limited Liability Company (LLC) designation protect you from having to take any personal responsibility for issues your business you might run into, but it’s also great for tax purposes. With an LLC, you can write off many of your business expenses. Do I have to file a schedule C (form 1040) if I have a business license? If you operate as a business in your state, you need to file Schedule C, or form 1040. If you go this route but don’t want to hire an accountant, then I strongly recommend that you use a bookkeeping software like Intuit Quickbooks. It will help you keep track of your expenses over the course of the year. In the United States, sales tax is a tax levied on products considered to be non-essential. And sales tax varies from state to state. For this reason, keeping track of sales tax when you’re selling in multiple states is difficult. Just another reason to get an accountant to help you with your books. Like many things in the US, each state has its own definition of a sales tax nexus. But, in general, the definition for ‘sales tax nexus‘ is: the place where your business has a physical presence. For example, if you have an office in Oklahoma, but some of your inventory is in California, your sales tax nexus is both California and Oklahoma. In other words, you would have to collect sales tax in both states. When do I need to file sales tax? In order to collect sales tax in the US, you need to apply for a sales tax permit. Then, once the state reviews your application, they will instruct you when to file. Typically, the government will tell you to file monthly, quarterly, or annually. Make sure to pay attention to the due dates they give you though! Failure to file on time can result in the termination of your sales tax permit. A deductible is a business expense that you can write off . By subtracting those costs from your adjusted gross income, you are helping to lower the amount of taxes you might have to pay. This is why I drive home the importance of having a great accountant. Deductibles can save you money on both your business and personal taxes. 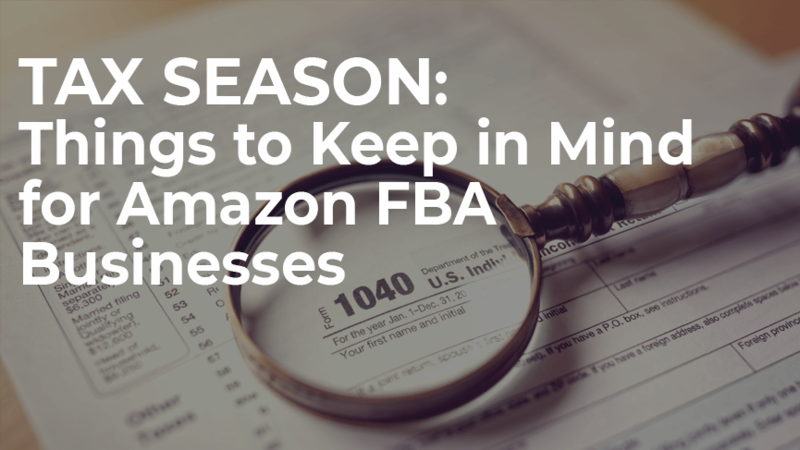 Hopefully this article has helped shed some light on the things you need to know in order to file taxes for your Amazon FBA business correctly. And if you still don’t have an accountant, you can look for one locally, or you can hire a vetted freelance accountant through Jungle Scout Market.